The best Hangover Treatment is the one you don’t have to swallow. We will show you how you can achieve this without the need of taking any pills or drinking any exotic or special blend of juices.In certain situations the felling is so bad that you do not want to take anything. Of course, everybody that enjoys drinking has experienced a hangover. Mainly because special events and parties last longer than usual and you drank more alcohol than usual. First, let’s try to understand what happened in our bodies and why this terrible hangover. Dehydration is one of the main causes that triggers a hangover the next day. If you happen to experience dizziness or nausea, it is usually caused by the inflammation of the cerebelum. The high levels of acidity from any type of alcohol that our liver is processing will remain for hours, until we help him out with the following biomagnetic therapy tip. Place a ceramic magnet on your liver. Make sure the negative (North Pole) side is facing your liver, and leave it there for at least 25 minutes. If you leave the magnet longer it’s fine, you can always practice this laying down or simply sitting down holding the magnet with your hand or using some type of masking tape. Applying an alkaline charge will balance the ph in your liver, and will also help with the natural inflammation associated with the alcohol intake. Balancing the liver’s ph will help the liver get rid of toxins much faster. 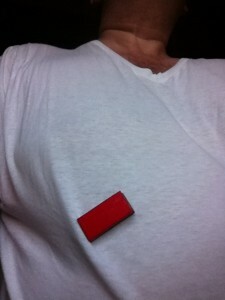 Place the magnet at the very edge of your last rib on your right side. Even though the liver which is our second largest organ, the skin is considered our biggest, it is mostly protected by our thorasic rib cage. See the placement in the image below. 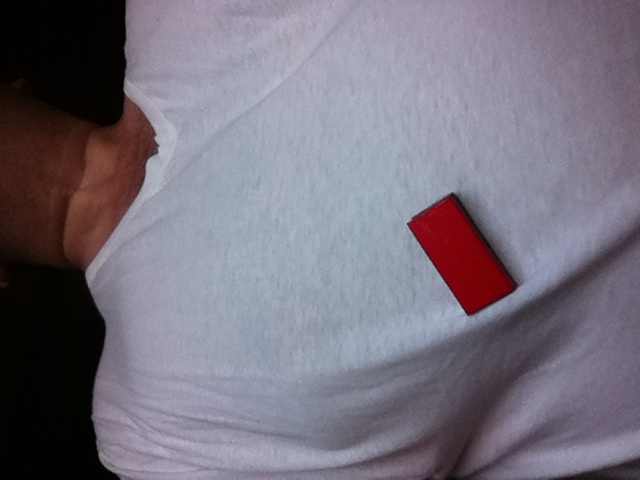 As you can see the magnet is being held in place because there is another ceramic magnet of the same size underneath the T-shirt. This gives you more mobility when you do not have the time to be laying down for 25 minutes. This is an exclusive tip from Biomagnetips, and you can apply this technique in several other parts of your body. Simply make a “sandwich” with ceramic or neodymium magnets, using what ever garment you have on. Just remember the thiner the fabric of the clothing, the better, otherwise the magnets may not hold in place. Magnets with a minimum Gauss reading of 3000 are recommended for this type of procedure. You can read more about these type of magnets and where you can get them in a previous post by clicking on this link; ceramic therapy magnets. The same goes for the cerebellum which after a big party and alcohol intoxication it makes us experience the nausea and dizziness. will be slightly below that line. The placement of magnets on your head is fine as long as you do not exceed a Gauss of 3,000. This hangover treatment with magnets can be left between you and your pillow through out the night. There is no time limit that you need to consider to take them off. There is no risk of over exposing yourself to magnets that do not exceed 3,000 Gauss. You can simply place a ceramic therapy magnet with the negative (North) side facing the back of your head, by placing it between you and your pillow. The hangover treatment with magnets is safe in many ways since it does not interfere with any other medication, it’s inexpensive, and non invasive. Please take some time to read our disclaimer since magnet therapy may not be for everyone. Therapy magnets are considered to be a supplement and not a substitute for any prescribed medical treatment. Always consult a physician and ask him if magnet therapy can be right for you.